Inspired by this sweet horse by littlenauli on Etsy, I made this frayed-edged little lavender filled horse for my friend’s birthday. It can be hung between clothing in a wardrobe or laid between folded clothes in a drawer. 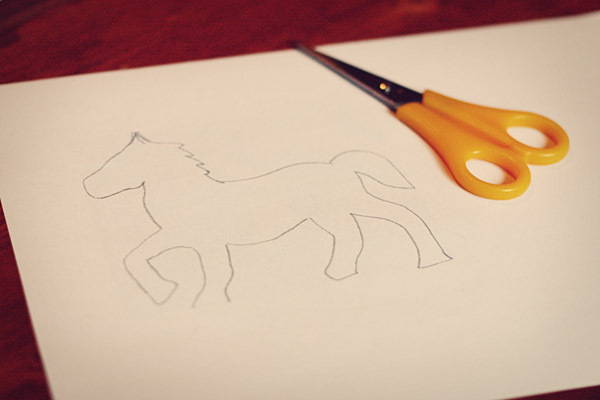 Print out a horse shape in the size you want (you can easily find horse images through google and use whichever one you like best) and cut it out. 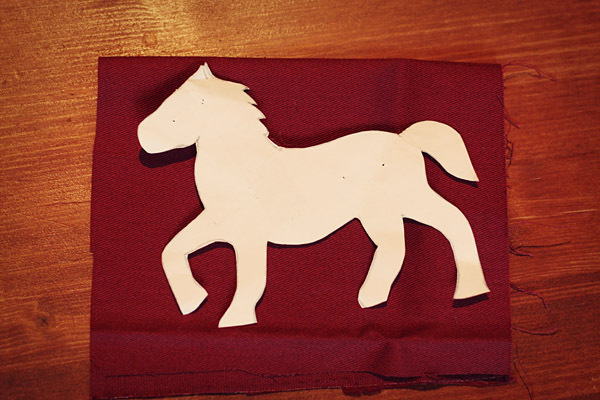 Get a piece of heavyweight fabric that is twice the size of your horse shape and fold it in two. I recommend home dec weight fabric at least, quilting cotton is a bit too lightweight for this project. 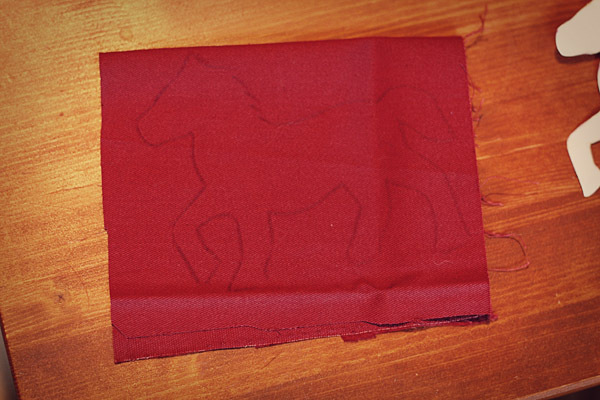 Lay the cut out paper horse on top and copy it using tailor’s chalk. 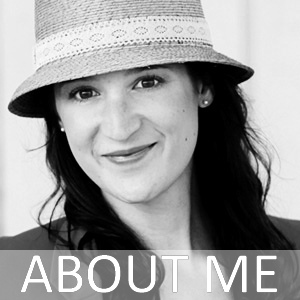 I use a special marker that fades over time and after a few hours has disappeared completely. Now, with your fabric still folded, stitch through both layers along the marked shape with embroidery floss. I like to use a simple running stitch, because it looks identical on both sides. You could do this by machine if you really wanted to, but it is easier to handstitch all the small shapes and curves. 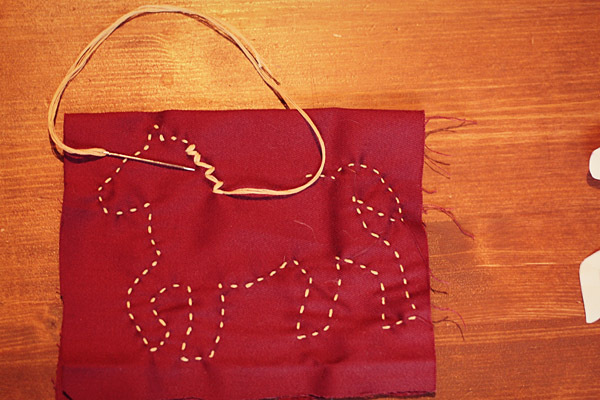 Leave a gap at the top and cut out the horse shape close to the stitching, leaving a little frayed edge (if you don’t like frayed edges you could finish this with a zig-zag stitch or serge the edges). I don’t mind frayed edges, so I just leave mine like this. Fill the horse with lavender buds. I used part lavender, part rice to give the horse a little more body and also because I am not too keen on a strong lavender scent. You can use a pencil to push the filling into the small parts like the legs and tail. 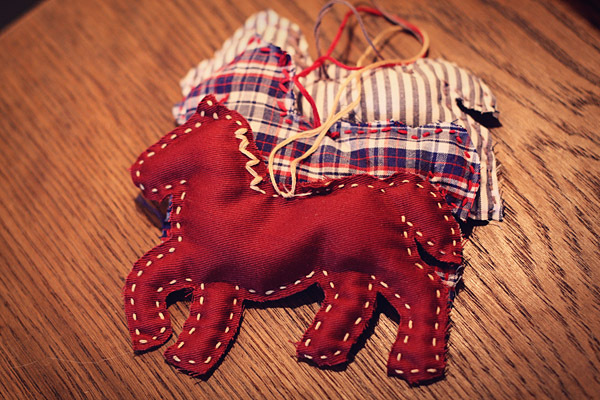 Fill it as tightly as you can (else the horse will be floppy afterwards) and then stitch the opening at the back closed. 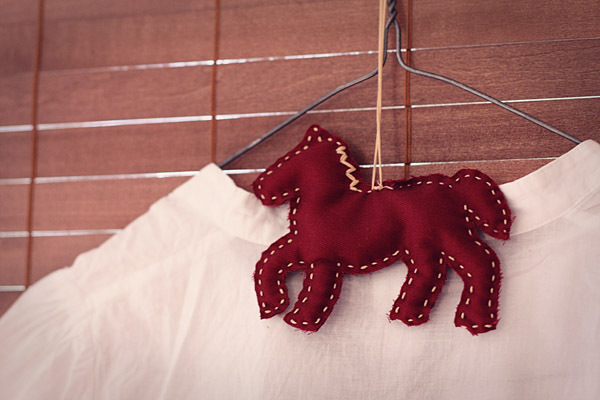 Trim the fabric edge at the back and make a loop to hang the horse on. If you don’t like lavender scent you can use a few drops of essential oil in your favourite scent on the horse and your clothes will smell heavenly! 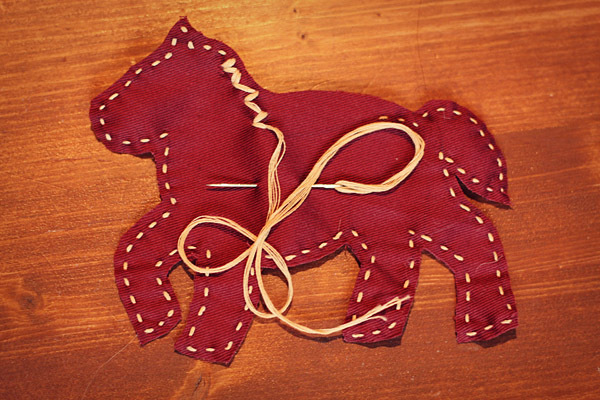 This entry was posted in Sewing and tagged hand stitching, horse, lavender sachet, Sewing on October 21, 2010 by Kristina. Das Rote mit dem gelben Faden – einfach nur perfekt! So Cute! You could also tuck one of these under your pillow for sweet dreams! Thanks Lynda 🙂 That’s a great idea, I hadn’t thought of that! those are so lovely and perfect for gifts!! Love this! I am a fan of horses so it really caught my eye, but these would make great gifts for the holidays – Thanks so much for sharing with us! 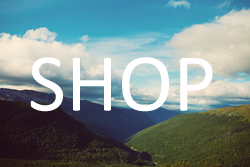 Pingback: Weekend Links « What. No Mints?